On March 21, 2019, the "Ocean Promise" with a crew of 24 on board suffered an engine falure north of Andros. The ship has not applied for assistance. It was enroute from Tanger-Med to Aliaga. In the sea area were strong winds which reached 8 to 9 Beaufort force. In the night hours the crew managed to restart the engine, but the initial voyage was interrupted, and the ship diverted to Piraeus at a reduced speed. 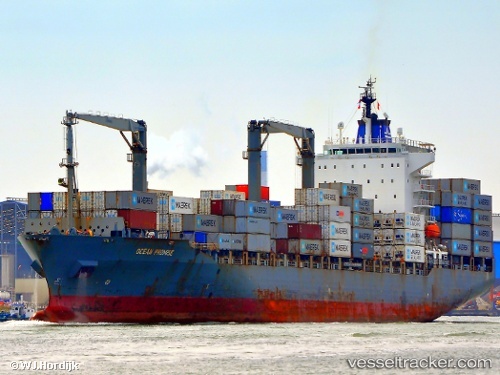 The vessel moored on the port's roads on March 22 at 5.35 a.m. in pos. 37° 51.36' N 023° 30.82' E. The "Ocean Promise" sailed from Nemrut Bay on Apr 1 at 8 a.m.
Hapag-Lloyd announced on Friday (Mar10,2017) its enhanced MSW Service. The Company will continue to provide its customers with a weekly fix day service from South Europe to South America West Coast. The enhanced MSW Service is planned to commence on March 26, 2017, in Salerno, Italy, with the southbound departure of Hapag-Lloyd own operated vessel M/V Ocean Promise (voyage 712S). Consequently, the first northbound sailing begins on April 30, 2017, in San Antonio, Chile with the same vessel, M/V Ocean Promise (voyage 712N).